Spotted something of interest on eBay or other online auctions, let people know here. Hello everyone, I'm a new member and have posted in the welcome section to say hello. Hopefully I don't get told off for being a Newbie and USE THE SEARCH FUNCTION, but I'm struggling to find information specifically about 20 inch wheels on a MK7 Transit. I know from what I have read here it is hard to find tyres with the correct load rating. I know 20 inch is huge, but because they are 8js I was thinking they might be okay. Before I get slated about the tyres, please note I'm trying to find out whether these alloys and tyres will create PHYSICAL issues driving on MWB MR MK7 2012 Transit? My MWB is a T350 so I have noted it's sits higher than other MK7 Transits I've seen. It also comes from the factory with 215 75 16c tyres which are pretty big and bulky. Plus I don't smash my van on top of kerbs, get on slow and soft and come off slow and soft. Please note I prefer the first set. Will it stick out the arches? Will it be fine on full lock and bumps? Will my standard wheel nuts fit in the holes on these alloys? Will it make my van slow by being too heavy? - will one of my 217 75 16c tyres with steel wheel be heavier or lighter than one of these 20s with tyres? Did someone buy the multi spoke? It's gone today... just curious. If it was anyone on here would love to see pictures. Thanks. 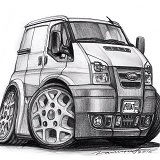 Sorry for unnecessarily bumping this thread, but the second link now links to some Ford Transit Custom alloys and not the second set of 20 inch multispoke wheels. The original listing I was referring to has ended, that's why it is showing the wrong set of multispokes now.